In February, we were delighted to pick up a coveted accolade in the 4th annual Nestlé Supplier Awards. 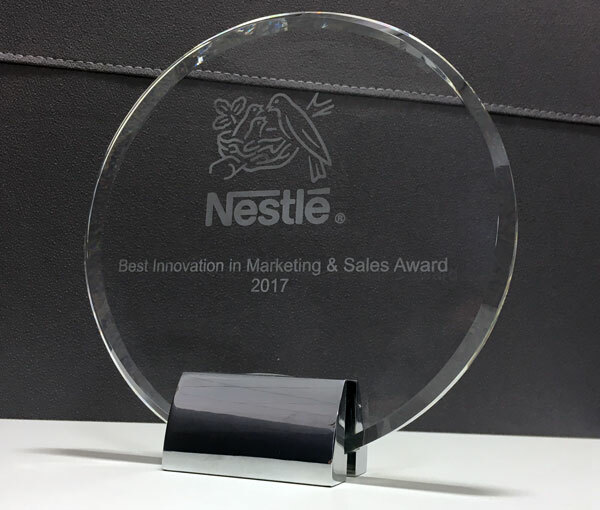 Following our work with Purina UK&I on the ‘One Domain’ project, we were presented with the award for the Best Innovation in Marketing and Sales. Before we began working on the project, Purina had sixteen separate domains for each of their brands. This meant that search engines struggled to understand the relationship between Purina’s portfolio of brands. The websites were essentially in competition with each other, diluting the efforts of digital marketing initiatives. After a period of planning, our team proposed the ‘One Domain’ project in 2016. As the name suggests, the aim of the project was to consolidate all sixteen websites into one, with the objectives of improving organic search visibility and driving efficiencies in all marketing activity. The project was certainly a complex one: it involved buy-in from a number of key stakeholders, as well as extensive collaboration across the different brands, agencies and internal departments. New ways of working had to be devised and implemented within Nestlé, as well as our own teams. Over a period of two years, our team worked on a number of core SEO tasks such as re-directs, content planning, website migration, and development updates. By working closely with the internal teams, we were able to ensure a smooth migration of all Purina brands to one domain: Purina.co.uk. The project led to a 96% increase in Top 3 search engine rankings, as well as a significant increase in organic traffic. Purina now has the highest share of organic search amongst their competitors, a position that was held by a key competitor brand before the One Domain project. As a further compliment to the team’s work, the project was deemed so successful for the UK brands that it is now being replicated across Europe, the Middle East and North Africa (EMENA). The Nestlé Supplier Awards were created to celebrate the suppliers that work with the global company. Now in their fourth year, they recognise the work of companies spanning a large number of industries, from transport and food to recruitment and marketing. This year, the event was held at Twickenham Stadium and hosted by TV’s Mark Durden-Smith. To receive the award for the Best Innovation in Marketing and Sales was a huge honour for our team.